Member of the Executive Committee of the Palestine Liberation Organization, Hanan Ashrawi, said in a statement on Friday that the Israeli hardline coalition government led by Benjamin Netanyahu is responsible for practicing blatant discrimination and generating a culture of hate and racism. 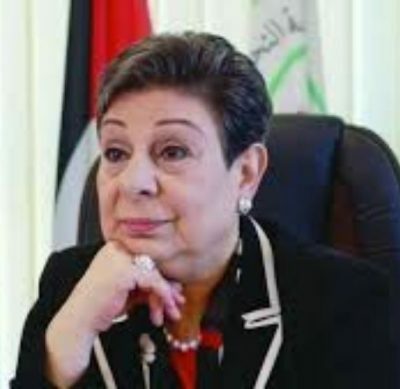 According to WAFA, Ashrawi was referring to recent hateful remarks made by top Israeli politicians which she described as inflammatory and inciting of hate against Arabs and Palestinians. “Such acts and words are undermining the chances of peace and enhancing hostility and mistrust between both peoples,” she said in a report that includes examples of inflammatory comments by Israeli government officials and leaders. “It’s good that a senior representative of the fifth column [Palestinian Knesset Member Haneen Zoabi] is leaving the Knesset. I wish her all success in Gaza or Beirut.” (January 6, 2019).